Errol: Just in case you want to hear me sing that in real life, it was on the 3 Geeks in a Pod podcast on Sunday, and there in the first 10 seconds! 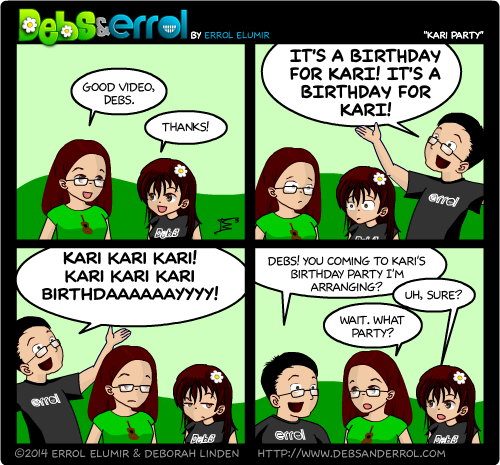 ^_^ Kari’s birthday, btw, was this past Sunday! And thanks for sharing all the links on our videos! Debs: Yes, for serious, guys. The shares have been amazing and have resulted in more Facebook friends! I’m totally conflicted over the fact that “Make It So” is killing “TIE After TIE” in views though. I like Star Wars more than Star Trek but I like “Let It Go” more than “Time After Time”. 😛 Fight! Fight! Fight! Kari’s Birthday! I’m expecting “Make it so” to eclipse the view count on most of your other videos fairly soon… I have no idea whether it will do as well as Errol did with “Every Major’s Terrible”, but I expect it to blow past everything else with relative ease. Edit: I’ve already watched “Make it so” through at least six times since it first came out. Happy Birthday Kari! I think for your birthday, we should all draw guest strip endings to WoB! I’m neutral about Star Wars / Star Trek and don’t know either of the source songs, but I’ll end up watching “Make It So” more because that’s the only place I can listen to the song. I also tend to play songs that are new to me more often than older ones. Really enjoyed both videos by the way, thanks for making them. I love both, but do love Trek more. I do however, dislike most of the movies, so I was surprised how much I loved the video. And yes, I’ve watched the “Make It So” video several times, even though I’m not a Star Trek fan. It’s just well done. I expect you’ll get a lot more views this week. …I may or may not currently be bawling while watching “Do You Want to Build a Snowman”. Curses! I’m a fan of both series but been a fan of Star Wars longer since I had some of the original Star Wars action figures. Yes Darth Vader with the bendable lightsaber toothpick in his arm. Both videos are good, almost makes me wonder when you guys will do a Doctor Who song. That would just give Comic Errol the excuse to run around with a sonic screwdriver until Comic Debs took it from him. On the other hand Comic Debs would probably wait until Comic Errol was gone and then she would play with the sonic screwdriver, am I right? I grew up with both and so didn’t really have a preference for either. It all depended. Star Wars had a bit more of a spiritual/magic element about it, so I think as a kid I latched more onto that. On the other hand, the Enterprise was awesome. Star Wars had more action. Star Trek was more cerebral. Haha I just saw your tweet Errol, and perhaps a parody of “I Want Pho” isn’t such a bad idea. Day two, and there are now only four D&E videos with more views than “Make it so”- I just wish that TIE after TIE was close enough behind that we could chalk this up to more consistent viewership than before… because you’re right, going viral (for any given value of viral) is nothing more than a flash in the pan, consistent viewership is a much better metric. I also think the community pushed “Make It So” more. I concur with Brian in regards to video, people have an easier time sharing that! And you guys rock for sharing it!